Anglian Home Improvements product development team have been working hard to get their new, one of a kind, dog conservatory on the market in time for summer. 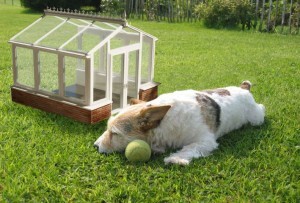 This unique dog conservatory is a 3 walled conservatory, it can be made to replicate any Anglian conservatory design, just downsized to fit your pooch perfectly. It even has guttering with a bowl at the bottom to give the dog a constant supply of water. Developed in the Anglian lab it is ideal for anyone who wants to spoil their dog, giving them a safe, warm, humble abode to snuggle in night and day. Creator Rex Wolfgang, a product development assistant, came up with the idea for his dalmation pup, Todd. He wanted to give Todd a secure, pleasant place to chill out in during the day whilst he was at work, especially after he kept chewing up the post when left in the house! The other managers thought he was barking up the wrong tree, but when Rex got on the dog and bone to the huskey voiced Marketing Director, he almost bit his hand off with excitement. Mr Wolfgang was hopeful this idea would be a great hit, and thanks to the help of Alfie we are now getting loads of leads. We are hoping it doesn’t get a rough reception on it’s official release later this year as I think this is a great idea for man’s best friend!